Tracking ancestors is like looking into a window's reflection. You try to to peer past the image on the surface to see the reality of the place beyond, the facts that form a pattern of relationship. The glass, the light, the time, the records and the lies distort the shapes within. Getting closer brings some clarity, but at times you just can't get reality right. You hope that in seeking your ancestors you will find a reflection of your own hopes, talents, quirks, health and graces. You may find those qualities, but they may come back imperfectly, distorted by the stir of genes, much like the swirling imperfections in the handmade glass of the Session House window. 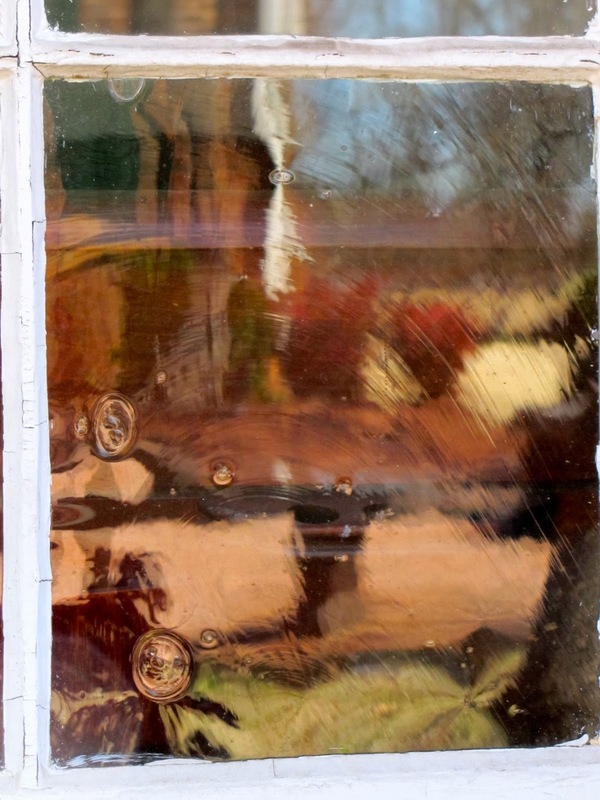 The Session House window reflects the church, the sky and the red bushes, but reveals little inside with clarity. Patrick Gracey is my third great grandfather. He is buried at the cemetery across from the Centre Presbyterian Church and it's Session House in Mooresville, North Carolina. If you look at his stone carefully, as I did yesterday, you will see that it says that he departed at the age of 110 years. My travels include visits to cemeteries precisely because even stones do not last forever. The base of this stone was piled with little bits of shiny stones sadly. Mary Templeton's marker has lost it's footing. Nearby lays a catastrophe of markers. They may be my ancestors or maybe yours. I came all of the way across the country to see for myself an image of my grandmother's gravestone. I have been having many adventures along the way, but I hadn't lost sight of my quest. Della Oliver. Isn't that a lovely name? Searching for her family led me to Plymouth Rock earlier in my travels. Had I not been looking, I would not have had that side adventure. Della was my grandfather's second wife. She was known as the "Belle of the Town". I'll soon travel to Charlotte, North Carolina, to see the only existing photo of her. I have seen it once and am eager to see it again. (Will she look like me?) Della's past has been a mystery to me for many years. I couldn't find the paper that gave the facts that I needed. Finally, a copy of her death certificate gave me her mother's name and her father's name. Della was not served well with extensive documentation of her existence. Unfortunately her gravestone exhibits the same degree of erasure of her being. Both sides of this stone are devoid of writing. The weather of ninety-eight years obliterated any trace of letters. The plot surrounded by a low stone wall has three of these stones. None have writing. Any one of them could be Della's! Iva knew the story of the stones. I might not have guessed it. When I was younger, I could have asked so many more questions. Don't delay too long in asking the questions that one day you may have. See that monument in the middle of this picture? That is the memorial stone marking the location of Della's husband, Robert Sinclair Templeton (1845-1921). Iva and Dan are helping me find Della. She is one of the stones. The far right small one or one of the two just to the right of the tall marker. Robert was fifty-two years old when he eloped to South Carolina with Della, a fourteen and a half year old. A clipping from the Mooresville paper, the Landmark, stated, "R. S. Templeton, Esq., postmaster at Mooresville and a Miss Oliver of that town were married in South Carolina several days ago. Mr. and Mrs. Templeton returned to Mooresville after their marriage, but is seems that for some reason the affair was kept secret. Mr. Templeton was in town this week and told some of his friends here about it." What! The window into my past makes me feel like I am a peeping Tom! I don't do crossword puzzles, although they are supposed to keep the brain sharp. I do genealogy instead. I have many windows to explore. 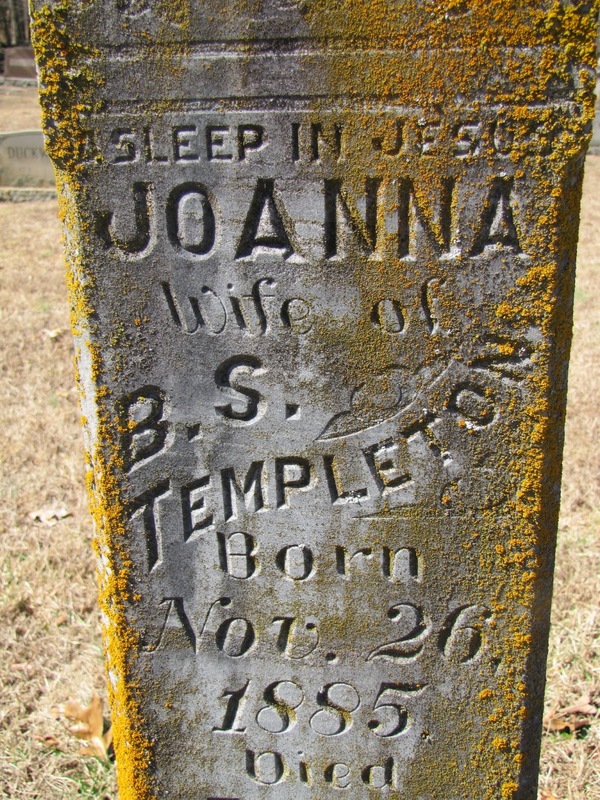 I took photos of any Templeton stone that I happened to come across in three small cemeteries. How many Templeton stones did I see? NINETY stones in one day! Searching for ancestors is not dull! I got to walk in the sunshine, solve mysteries and laugh a little. I like doing genealogy. I don't think that I am related to these folks. Are you? who departed this life January 9,1810. The busy scene of life is closed. Reclining on its Saviour's breast. Where cares no more shall spoil its peace. It shall enjoy enternal rest. Are sorrow, toil and pain." And regarding your comment that he was a slaveholder... I'm not so sure about that. Although most of the folks who lived in that part of 18th century North Carolina had slaves if they could afford them, are we certain that he did? Slaves were always listed in one's will. Patrick Gracey's will enumerates all of his property in great detail but makes no mention of any slaves. So I'm not sure what the truth is on that.